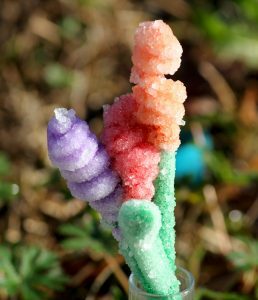 Borax Crystal Flowers for a Spring or Easter Bouquet Recently updated ! Grow pretty borax crystal flowers. These colorful flowers only take a few minutes to set up and a couple of hours to grow. It’s a fun project for kids and a great way to decorate with flowers that won’t ever wilt. Now, I recommend borax because it’s super-easy to grow the crystals, but if you can’t get hold of this chemical, you can use sugar, Epsom salts, alum, or table salt. The basic process is the same, no matter which substance you use. The difference is the size and shape of the crystals and how long it takes for them to form. Don’t be afraid to experiment! The first step is to form the flowers. You can be as creative as you like, so long as the finished flower fits inside the glass, which will hold your crystal solution. I made the flowers shown here by spiraling pipecleaners around a pencil. Then I twisted one end of the “flower” to a green pipecleaner to form a stem. I made a couple of flowers this way and even a leaf. Use the scissors or wire snips to cut away excess flower-colored pipecleaner, but keep the green stems nice and long. Turn your “bouquet” upside down and put it in the glass. Wrap the stem around the pencil and adjust the pipecleaner flowers so they don’t touch the bottom of the glass. It’s also best if they don’t touch the sides of the glass or each other, because they’ll stick together as crystals grow. Remove the flowers/pencil from the glass. Next, make the crystal growing solution. To do this, boil enough water to fill your glass. I used a tea kettle, but you can microwave the water in a microwave-safe bowl or run water through your coffee maker, etc. Pour the water into a bowl or large cup and stir in borax (or whatever you’re using) until no more dissolves. You can tell you’ve reached the saturation point when you have undissolved solids at the bottom of your container, no matter how much you stir. This is the crystal growing solution. Pour the solution into your glass, but avoid pouring in the undissolved solid. It’s no big deal if a little bit gets into the glass, but any solids will compete with your flowers for crystals. Add the flowers to the glass of solution. Place the glass somewhere it won’t get spilled or disturbed. Crystals will start growing within half an hour or so. It’s up to you how long to let them grow. If you want a light dusting of crystals, remove the flowers from the solution after an hour or two. For as many crystals as possible, leave the flowers in the liquid overnight. Remove your flowers. Either hang dry them or set them on a paper towel. When they are dry, place them in a vase or use them as a decoration. Another simple crystal flower to make using pipecleaners is a crystal rose. But, you don’t have to use pipecleaners. It’s also easy to grow crystals on a real flower!